Is there a better alternative to IntelliMerge? Is IntelliMerge really the best app in Email category? Will IntelliMerge work good on macOS 10.13.4? 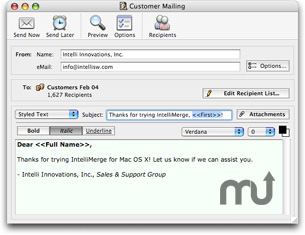 IntelliMerge is dynamic e-mail merge software designed to simplify keeping in touch with customers, family, and friends. Featuring an integrated message editor, recipient database system, and message mailer, it's all you need to manage contacts, create personalized e-mail messages, and send them out over the Internet. Version for Classic Mac OS is available here. IntelliMerge needs a rating. Be the first to rate this app and get the discussion started! Web Page Messages: No more fumbling with the Custom HTML editor and absolute images when you've designed your HTML-based e-mail message in a WYSIWYG editor like Macromedia DreamWeaver or Adobe GoLive. The new Web Page message types enables you to post your e-mail template to a folder on your Web page, give IntelliMerge the URL, and press send. Everyone will receive that page as it appears in a browser -- right in their e-mail. Even images and links "just work" as expected. Complete Documentation: Back by popular demand, IntelliMerge now includes comprehensive PDF documentation with detailed usage instructions, tips, and common troubleshooting techniques. AutoSubscriber: Let your subscribers and members add or unsubscribe themselves from your subscriber lists, without having to have IntelliMerge open. Simply upload the IntelliMerge AutoSubscriber PHP script to any Web server for instant integration with existing Web sites. The script also gives users the flexibility of adding a one-click "unsubscribe" link to the bottom of your messages. Smart Send Later: Added by popular demand: set your mailing to start at the exact date and time you specify. Just set it and forget it, and IntelliMerge will take care of the delivery for you, automatically. Activity Log: Get detailed information on how and when you sent your campaigns with IntelliMerge's permanent activity log. IntelliMerge can even alert you to recipient problems with specific error information. SmartBar Integrated Tip System: Every message editor includes an intelligent tip bar that provides tips on making sure your message contains everything it needs to send. Message Preflight: Catch mistakes before you start sending. Preflight helps you make sure everything's correct before your message is sent. You're presented with all of the details, an up-to-date recipient count, and quick access to a dynamic message preview in one window. Smart Bounce Management: Bounced messages don't have to get in your way. Specify the Return-Path in the Options dialog, and all bounces and errors will go to a separate e-mail address. Image Insertion: You can now insert images in Styled Text messages -- no HTML coding required.